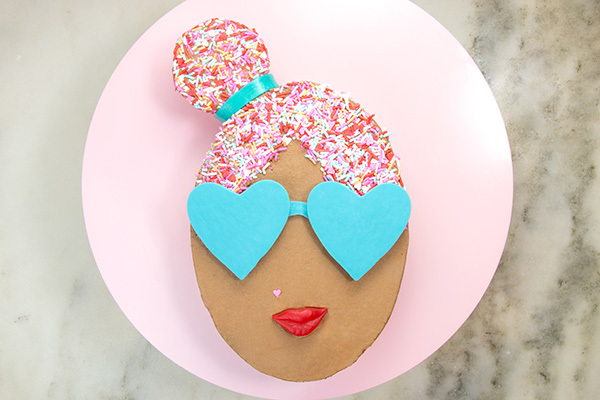 Sprinkle Girl Cake – how to make cute girly face cakes with sprinkles for the hair and chocolate heart sunglasses. 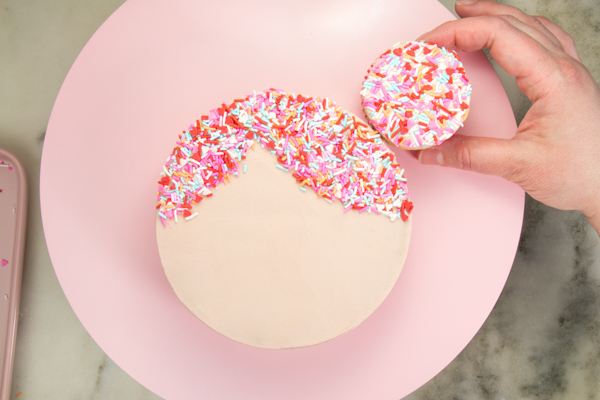 A new cake tutorial by our contributor Erin Gardner. 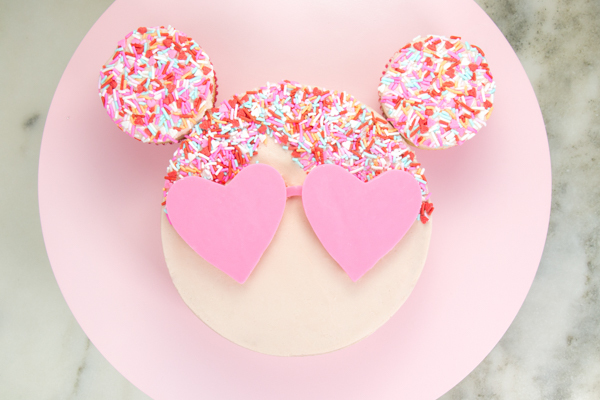 I am officially obsessed with these little sprinkle-haired cuties. A few years ago cakes featuring girls with hair made of berries and fresh fruit started popping up all over instagram. Instantly, I used my dessert forces for evil and thought, “Oooh, that’d be even better with candy or sprinkles!” The idea was filed away in the back of my brain and forgotten. Fortunately, it didn’t disappear entirely! It popped back up as I brainstormed ideas for Valentine’s Day cakes. 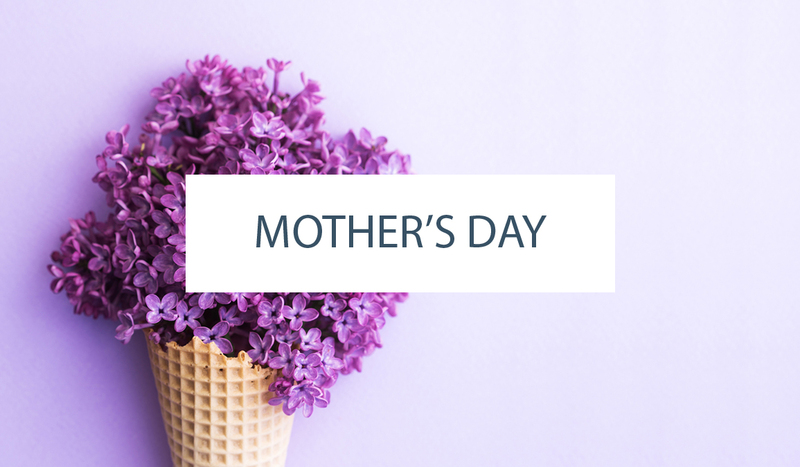 V-day is often a time to get all smoochie with your sweetie, but it’s also the perfect opportunity to celebrate the special gal pals in our lives, both young and old. 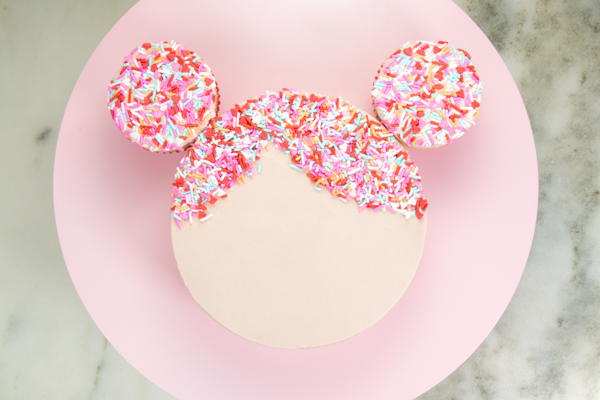 Take away the little cupcake buns (or leave them, do you), and it’d also be cool for a little dude. 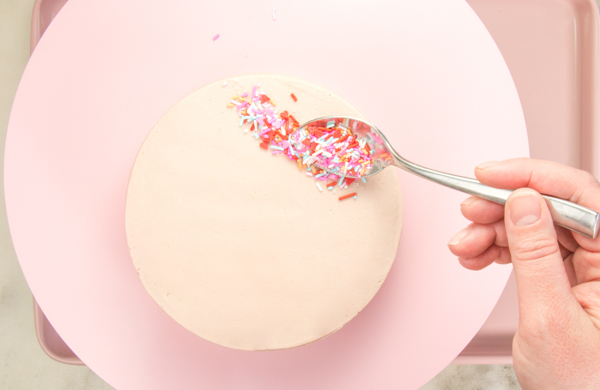 I can see this cake taking shape a million different ways – endless sprinkle blend options, glasses in flower shapes, circles, diamonds, or even seashells for a little mermaid (OMG, DOING THAT NEXT). 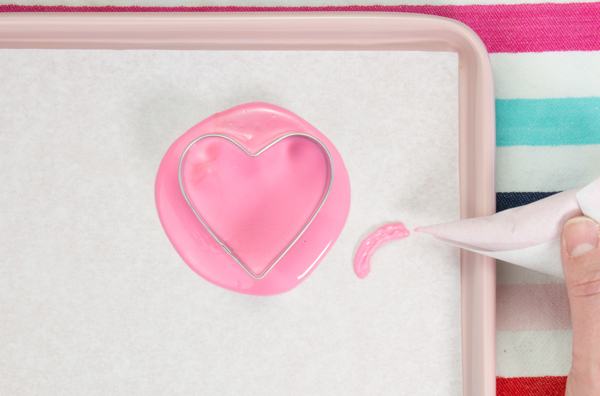 I can’t wait to see how you make this design your own! Melt the coating chocolate in a small heatproof bowl in the microwave at 50% power or over a double boiler and line a baking sheet with parchment paper. Spoon a puddle of melted chocolate onto the paper and tap the sheet against your work surface to spread the chocolate out and smooth it over. Drop the heart cutter into the chocolate. Pop the tray into the fridge to help the chocolate harden quickly, about 5 minutes. 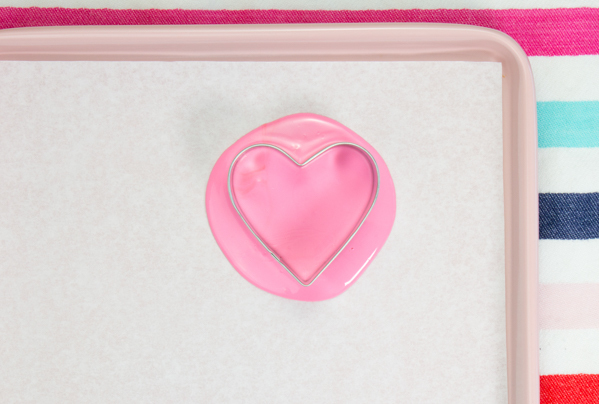 Lift the cutter from the hardened chocolate and carefully push the heart out. Repeat to make a second heart. Fill a small piping bag or paper cone with the melted chocolate. Pipe a small arc to make the bridge of the sunglasses. 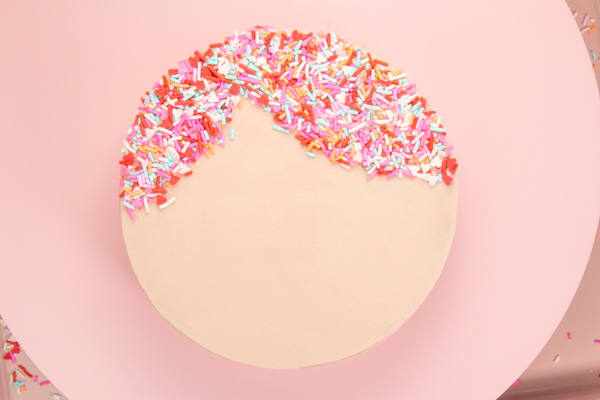 Carefully add spoonfuls of sprinkles to the upper portion of the cake to create “hair” on each side of a part. I picked side parts for my cuties, but you could just as easily go for a classic center part. One the sprinkles are placed, tap the spoon on top of them to press them into the buttercream. 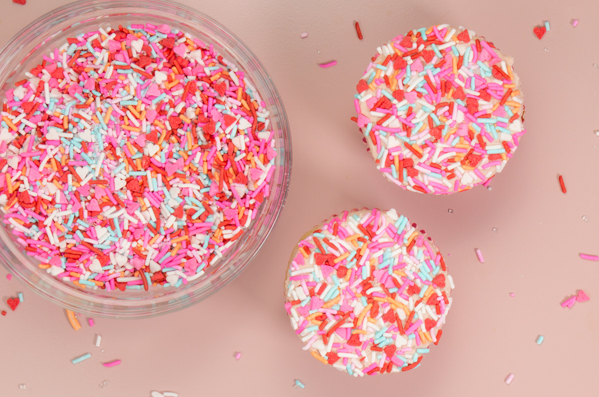 Use the tip of a skewer or toothpick to remove any stray sprinkles. 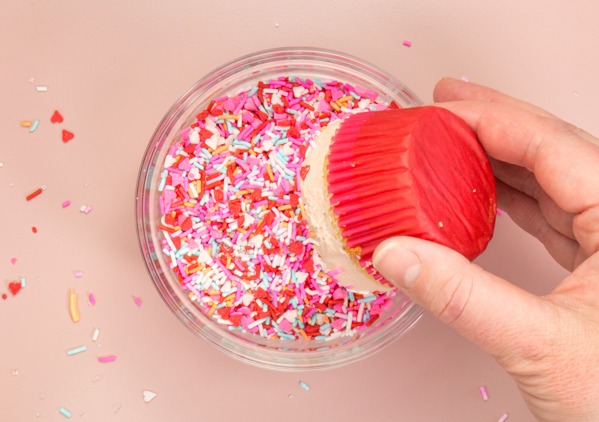 Pick up the cupcake and press the frosting into the sprinkle blend to completely cover the surface of the cupcake. 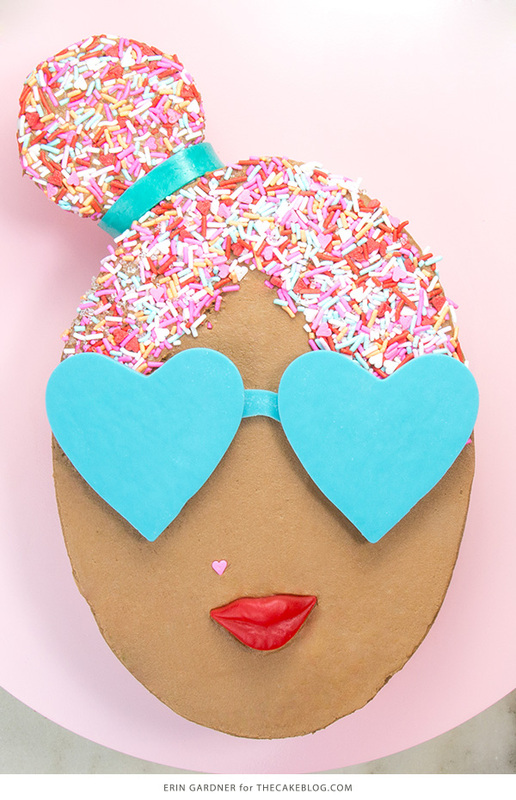 Add the cupcake bun to your sprinkle hair. 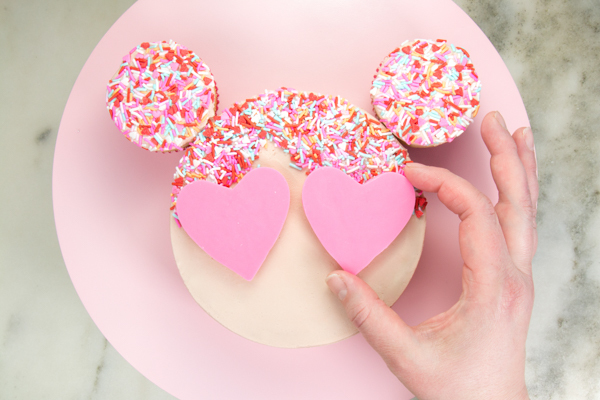 Attach it to the cake with a dab of buttercream on the side or the bottom of the cupcake to keep it from sliding. Repeat to make as many buns as you like. 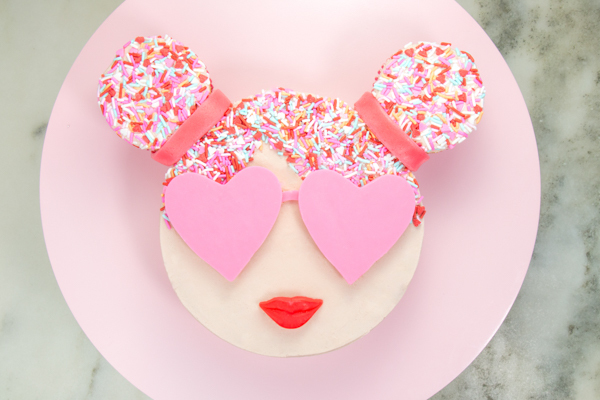 Add the heart-shaped lenses to the cake using a dab of buttercream on the back of each heart. This also helps lift them up a little, so they don’t lay completely flat on the cake. Slide the bridge in between the lenses and poke it into place with a skewer or toothpick. 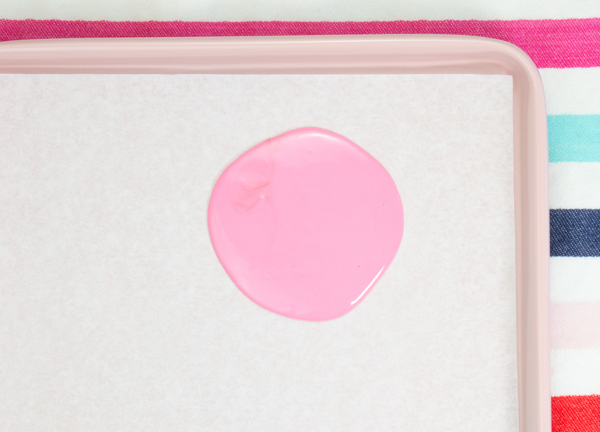 Cut a 1/2-inch wide strip from a piece of taffy candy in a coordinating color. Place the strip over where the cupcake touches the cake and tuck the sides down. Repeat with the other bun, if using. 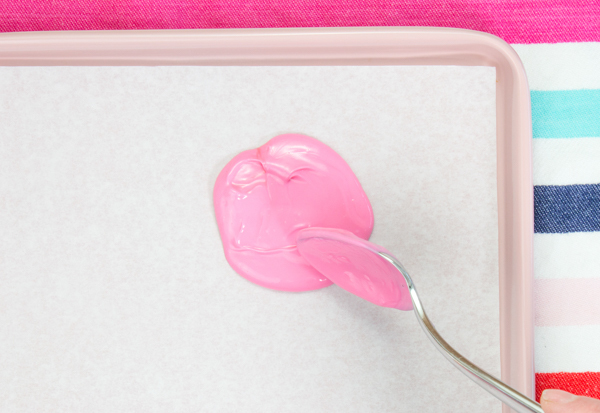 Get even fancier and create tiny bows out of the taffy candy, just like you’d make a fondant bow. 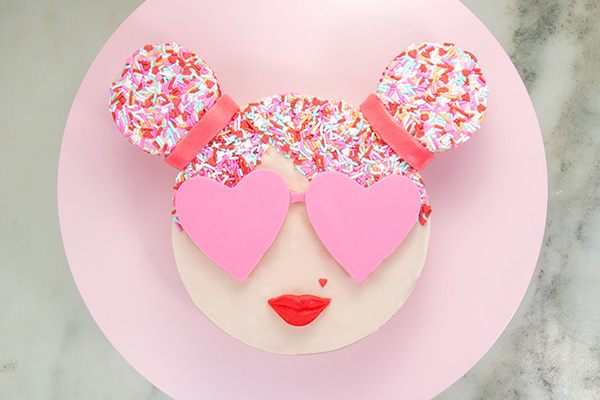 Add the candy lips and a tiny heart sprinkle beauty mark. 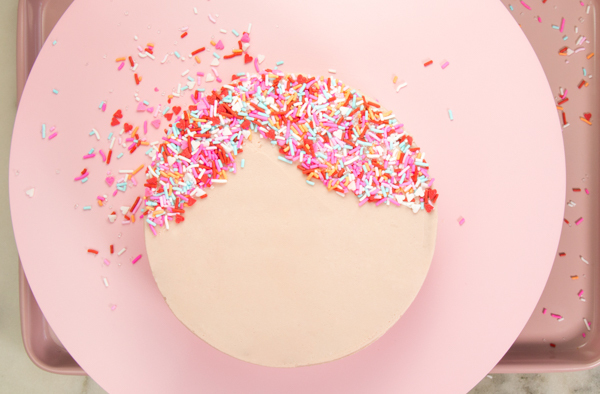 If you make a Sprinkle Girl Cake, be sure to share it with us. Tag @thecakeblog on Instagram or use #thecakeblog. 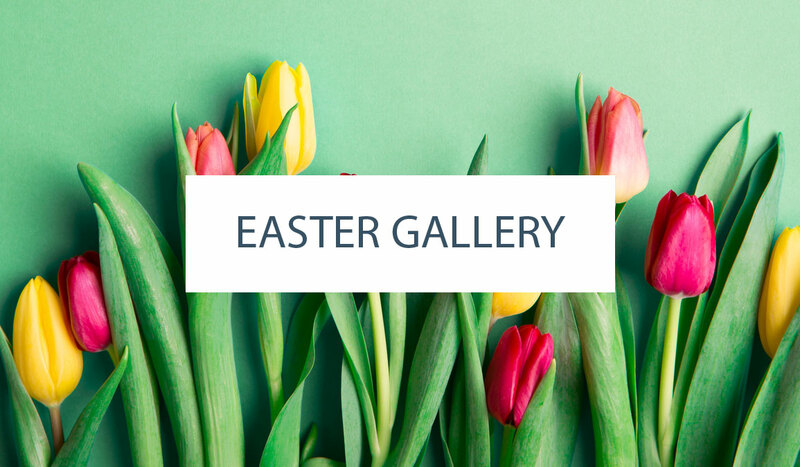 Or if you’re more of a Pinterest person, upload your photo onto our pin! 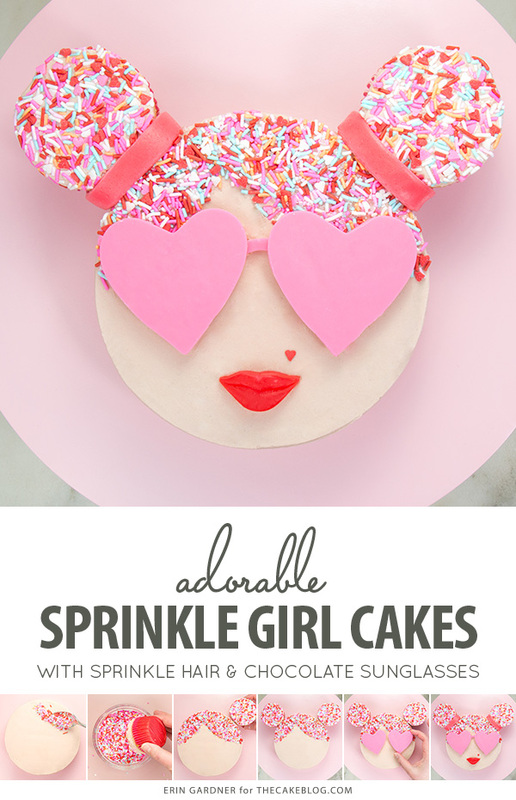 Love this Sprinkle Girl Cake and will be making this today. My question is did you make a 3 layer 6″ cake? Worried about the cupcake buns staying put after attaching with buttercream. Hi Pam! This is a single layer cake, so it sits at the same height as the cupcake. I’ve never made this design as a taller layer cake, so I’m not 100% sure on what the best method would be. I would think you could attach the buns with dowels through the cupcake liner. Or possibly stack cupcakes or mini cakes beneath the bun and attach them to each other. Hope this helps! 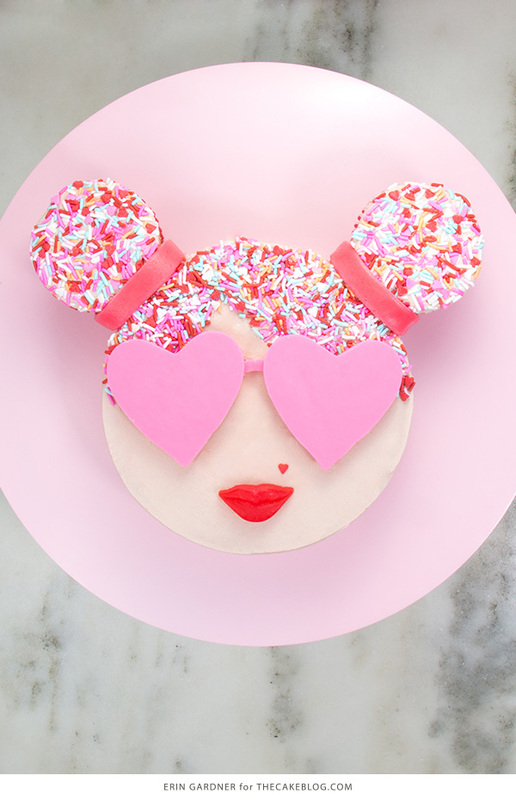 I like the idea for the sprinkle girl cake . I would probably try to make it for myself. Great Idea!